Oftentimes people will send hiring managers resumes with no cover letters or resumes with average cover letters. These go into the junk mail pile. Always include a cover letter with your resume even if it is not asked for. If you read about how to write a resume, you might remember that the goal of excellent resumes is to win an interview with a potential employer. Cover letters are the same way: the purpose is to get an interview. Sometimes it may be the case that a stellar cover letter with an average resume will win an interview (although you definitely want a stellar resume, too). In this paragraph you are telling the hiring manager why you are writing in a few sentences. State the position you are applying for. Only tell how you heard of the position if it is through mutual contact or a recruiting program. 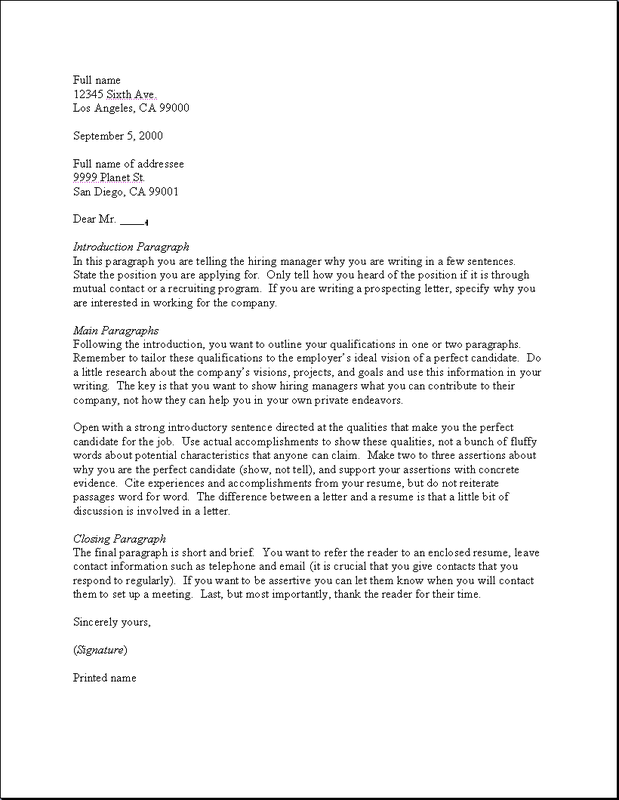 If you are writing a prospecting letter, specify why you are interested in working for the company. Following the introduction, you want to outline your qualifications in one or two paragraphs. Remember to tailor these qualifications to the employer’s ideal vision of a perfect candidate. Do a little research about the company’s visions, projects, and goals and use this information in your writing. The key is that you want to show hiring managers what you can contribute to their company, not how they can help you in your own private endeavors. Open with a strong introductory sentence directed at the qualities that make you the perfect candidate for the job. Use actual accomplishments to show these qualities, not a bunch of fluffy words about potential characteristics that anyone can claim. Make two to three assertions about why you are the perfect candidate (show, not tell), and support your assertions with concrete evidence. Cite experiences and accomplishments from your resume, but do not reiterate passages word for word. The difference between a letter and a resume is that a little bit of discussion is involved in a letter. The final paragraph is short and brief. You want to refer the reader to an enclosed resume, leave contact information such as telephone and email (it is crucial that you give contacts that you respond to regularly). If you want to be assertive you can let them know when you will contact them to set up a meeting. Last, but most importantly, thank the reader for their time.